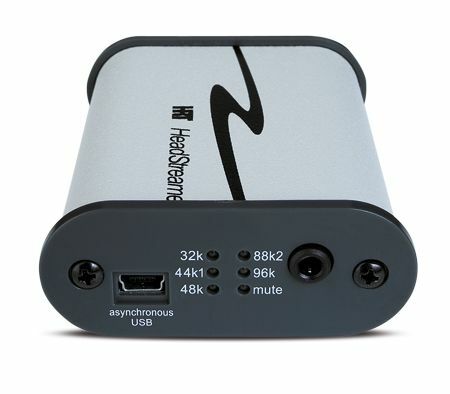 High Resolution Technologies HeadStreamer review | What Hi-Fi? If your music system consists of a computer and a pair of headphones, HRT's HeadStreamer could well be just the product you need. Your £145 buys a well-finished little box that contain a mini USB input and 3.5mm headphone output. The former is asynchronous, which means the DAC controls the flow of data rather than the computer – resulting in a more-accurate sound. Power is accepted via USB, so this is a truly portable device. Apart from a series of LEDs indicating the sampling rate of the input signal – the HeadStreamer's high-resolution support is limited to 24bit/96kHz recordings – there's nothing else of note to mention. The story is rather different when it comes to performance. In this respect, the HeadStreamer is something of a sonic superstar. Compared with the output of our Apple MacBook, the HRT delivers a sound of significantly more insight and purity. Where the laptop delivers a relatively hard and edgy presentation with the likes of Bon Iver's Perth, the HeadStreamer finds extra doses of space, refinement and detail. Move onto the likes of Beethoven's Fifth Symphony or Jay Z's D.O.A. (Death of Autotune) and the HRT's advantage becomes even more apparent, with its more varied dynamics and better defined leading edges. The ability to convey rhythms improves, too. for a very sensible amount of money.